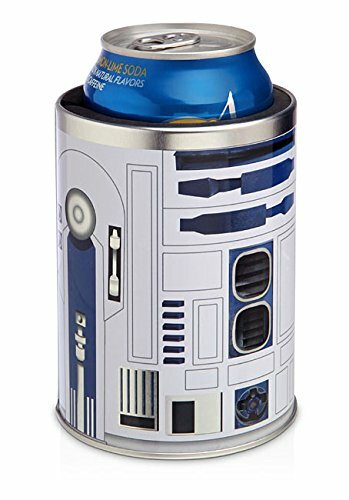 Keep your drinks cold in this brilliant can koozie that's shaped to fit your can like a glove. It's also shaped just like Star Wars' famous droid sidekick, R2D2. This officially licensed can sleeve holds 12 oz cans. The rubber lining holds your drink snug, so your drink stays cold while your hands stay warm. The cooler also has a hole at the bottom to prevent a vaccuum forming so can removal is easy. This works as a beer huggie or a koozie for your favorite canned soft drink. Let R2D2 be your trusty and helpful droid. No one will do a better job keeping your can cool than this little guy!